On Bleecker and Broadway circa 1868, at Pfaff’s beer cellar, social impresario Henry Clapp devised his version of New York's café bohemia and would hand pick (a la Studio 54) those patrons fascinating enough to sit at the long table in his 'vaulted room.' The history of this hot spot and its hothouse crowd is chronicled in Justin Martin's Rebel Souls. Sometime journalist and fledgling poet Walt Whitman was there, not yet singing the body electric, but being upstaged by the boozy, carousing and smart set of writers, actors, dancers and arty riff-raff. Most bohemian of all, vis-à-vis prevailing mores of the time, were the unaccompanied women pursuing their own writing careers and undisputed stars at Pfaff‘s. Ada Clare, dubbed the Queen of Bohemia, holding her own with the men and not only a progressive thinker who defied every convention for women of the day, wrote about sexuality and prescient feminist principals. Adah Menchen, writer turned actress, toured internationally with her spectacale Mezzapa, famed for her virtual nakedness strapped to the back of a horse onstage. Also in the orbit of the Broadway bohemians were the theatrical Booths, alcoholic father Julius and sons Edmund and John Wilkes Booth, who already had political ties to anti-Federalists. Renegade journalist Jack O’Brien, delved into fiction and may have been one of the first prescient to what would be known as magic realism. The mid-western newspaper humorist named Charlie Brown, in his mid-20s, landed at Pfaff’s has and developed his act under the name of Atremis Ward, who Martin cites as America’s first stand-up comedian. Just across from the “vaulted room” in Pfaff’s adjacent bar the “confirmed bachelors” bellied up and Walt was more animated in what could have been New York’s first unofficial gay bar scene before the word homosexual was even coined. Meanwhile, at Clapp’s table everyone moving from one artistic gambling enterprise to the next. Poetry was in fact a most mainstream form for popular culture. Indeed, as Martin chronicles, the first, raw editions of Whitman’s Leaves of Grass sold poorly, but caught the attention of naturalist guru and writer Ralph Waldo Emerson who traveled to New York to meet Whitman. In a hilariously embarrassing episode, Whitman tried to use his association with Emerson to his commercial advantage and alienated him in the process. Hugh Ludlow celebrated among the bohemians as the author of the very successful The Hasheesh Eater travels with the highly successful painter Albert Bierstadt, at his request, to chronicle their trip in words as Bierstadt was painting scenes of the frontier. They landed in San Francisco, where Ludlow sought out opium hongs in Chinatown. The Civil War changes everything and the bohemians go their separate ways, with varying degrees of success and failure. Menken, Ward, Clare and others moved westward, they crossed paths with other emerging artists and soon to be illustrious figures in American arts, including a young Mark Twain, who was in his 20s and already with a protean background and already established as sharp social observer as a journalist. Also in the orbit of the Broadway bohemians was the Boothes, alcoholic father Julius and sons Edmund and John Wilkes Booth, who already had political ties to anti-Federalists. In one of the most moving sections of Martin chronicles Whitman’s search for his brother George, who was among the Union soldiers listed as wounded. Whitman not only finds him wounded but alive, he is so moved by his tour of the hospital wards and the relentless casualty list that he stayed to provide company and comfort for the soldiers languishing in wards. He also fell, famously, in love with DC coachman Peter Doyle. 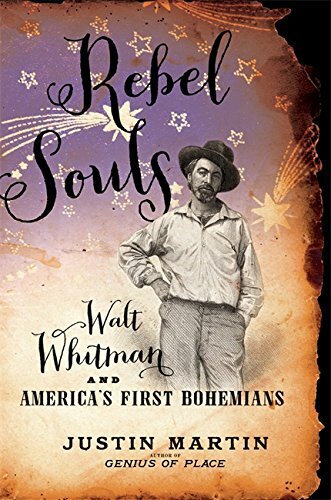 Martin’s historical scope and elegiac prose, laced through with parlance of the period, is not only grandly entertaining to read, it rescues this bit of cultural history and gives Whitman a more human dimension past the iconic image.